ci.csn.khai.edu - set of services to provide Continuous Integration processes in software engineering, i.e. the application of engineering to the development of software in a systematic method. To introduce and apply state-of-the-art methods, tools and approaches of software development in educational process. 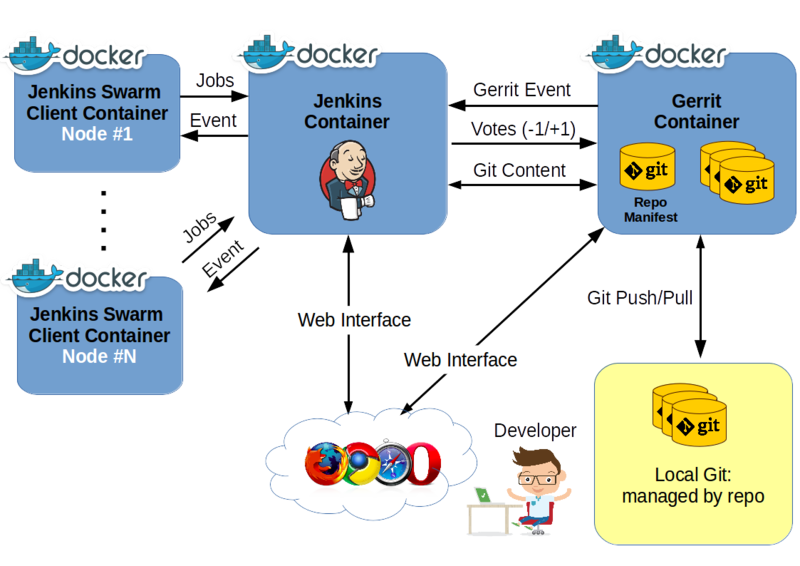 ci.csn.khai.edu infrastructure consists of several docker-based components (db-gerrit - mysql:latest, gerrit - openfrontier/gerrit, jenkins - tivalii/jenkins, proxy - nginx:1.12.2) that form a bunch of Gerrit Code Review and Jenkins. To control multi-container Docker applications Docker Compose is used. Sign in with your some.student@student.csn.khai.edu account in Gerrit Code Review. Find and clone specific project with git clone command. Send your patch set (changes) on review with git review command.